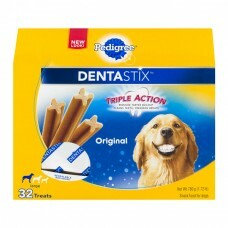 Pedigree® Dentastix™ Triple Action Original Treats Large. New look! Reduces tartar buildup, clean teeth, freshens breath. Snack food for dogs. Try our other great tasting pedigree® treats! Dentastix, fresh, biscuit, large. Dentastix, triple action. Feed The Good™. Dogs bring out the good in us. Pedigree® brings out the good in them. It all starts with tasty food they love and perfect nutrition to keep them healthy and happy. *Based on sales data. America's # 1 Daily oral care treat*. Patented x-shape. Helps clean down to the gumline to promote healthy gums. Chewy texture scrapes away plaque while chewing to help clean hard-to-reach teeth. Clean teeth. Freshens breath. Clinically proven to reduce plaque and tartar buildup. Guaranteed analysis: Crude protein (min.) - 8.0%. Crude fat (min.) - 1.0%. Crude fiber (max.) - 4.5%. Moisture (max.) - 18.0%. Calorie content (calculated): 2860 kcal me/kg, 76 kcal ME/ treat. Waltham. The world's leading authority on pet care and nutrition. www.pedigree.com questions comments? 1-800-525-5273. ®/tm Trademarks ©Mars, Incorporated. The Smiling Dogs are trademarks.